The release of the iPhone 4S was a huge success that its sales are sweeping its competitors by storm. Apple sold 4 million units in just three days after it was launch making it the fastest selling gadget available in the market today. • And of course the popular personal assistant, Siri, that comes with the new iOS 5 of the iPhone 4S. And so for 2012, gadget lovers and Apple fanatics are all waiting for the release of the next generation of iPhone, the iPhone 5. When iPhone 4S was launched last October, consumers are actually expecting the release of iPhone 5 but instead what they got was just an upgrade of iPhone 4, with a better camera and processor. This added to the anxiety of Apple lovers out there which makes iPhone 5 one of the top gadgets being look forward to this year. 1. Apple has been consistent with the display size of their iPhones and they maintained it at only 3.5 inches even if competitors like Samsung are going for the bigger and wider display. Rumor has it that the new iPhone 5 will have a bigger display this time at 4.3 inches. The screen is said to be made by LG and will use the same material as LG’s HDTVs. 2. If Apple will be increasing the display size for the iPhone 5, it follows that the screen resolution would also increase so as not to compensate the pixel density and so it is safe to assume that a 1080×720 resolution is suitable for a 4.3 inch display. 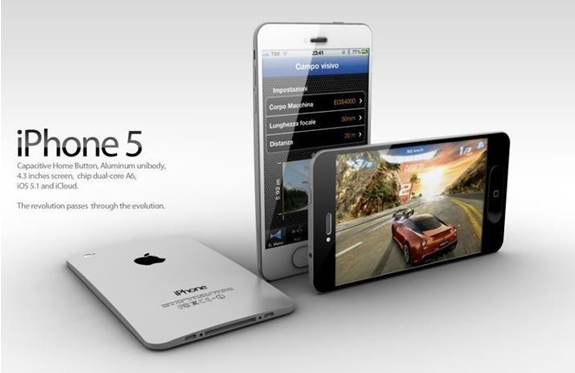 3. iPhone 5 will be the fastest iPhone after its release as it will be utilizing a quad core A6 processor. Aside from speed, the A6 processor will also help in efficiently using the power at it said to extend battery life thus allowing 20 hours of video call by 3g and 10 hours of video call by 4g. 4. iPhone 5 is also said to be capable of 4G LTE technology, which makes video, and voice calls at lighting speed. 5. The shape of the iPhone 5 will also be longer and wider (but thinner) to accommodate the larger screen. The material that will be use for the casing is aluminum unibody as oppose to the glass that was use for iPhone 4S. 6. The new iPhone 5 will come with the new waterproof technology using Liquipel waterproof coating. The Liquipel waterproof coating will be pre-applied to the phone and it is invisible to the naked eye. This coating will really make the device water proof at it will prevent water from getting in contact with the device and all the other hardware parts inside the unit. So when will the new iPhone be release? According to a reliable source, the iPhone 5 is already close to going into production so it is predicted to be announce in Apple’s annual developer’s conference in June and will be release in the market come July or August. Now I am sure Apple lovers all can’t wait to have all of this rumors confirmed and have their hands on the next generation of iPhone. Author’s Bio: The author, Abie, is a free lance article writer and professional blogger. She currently works as a content provider for t shirt printing, a brand new website that offers t shirt printing and personalized clothing.